Description: The six-pointed star has a circular centre with the GRI/VI monogram, surmounted by a crown and inscribed THE ATLANTIC STAR around the foot. 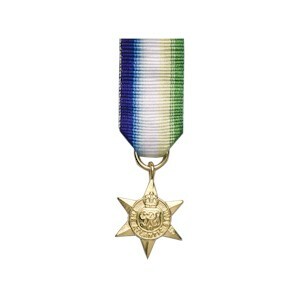 Comments: Issued to commemorate the Battle of the Atlantic, this star was awarded in the Royal Navy for six months afloat between 3rd September 1939 and 8th May 1945 in the Atlantic or home waters and for personnel employed in the convoys to North Russia and the South Atlantic. Merchant Navy personnel also qualified as did RAF and Army (air crews and maritime gunners) who served afloat or operated over the designated waters.